Swamini Lalitananda grew up in a traditional Vedic family and studied under her grandfather, Pundit Suryanarayana Murty Shashtri, a reknowned scholar of Sanskrit and Vedanta. She was initiated into sanyas at the Swami Sivananda Ashram. 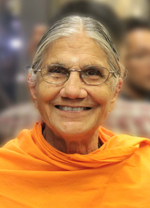 She furthered her studies in Anaikatty, Coimbattore, Tamil Nadu, Rishikesh, Uttar Pradesh, and the Himalayas under Swami Dayananda Saraswati of Arsha Vidya Gurukulam, a well-respected teacher of Vedanta. She also studied in Kailash Ashram of Rishikesh, the oldest school of Vedanta in this "City Of Saints." Swamiji was a resident faculty member of Hindu University in Orlando, Florida. Earlier, she was in charge of Yoga studies at Andhra University in India. She studied there as well as at Sri Venkateshwara Yoga Research Institute in Tirupathi, as well as in Canada. Since coming to the United States, she has taught Yoga teacher training courses as well as meditation and scriptures like the Bhagavad Gita and Upanishads.